We like fearless action heroes. Arnold Schwarzenegger epitomizes the image of the action hero who rarely shows a hint of weakness and kills without remorse. In 1987’s Predator, he does have a few moments where he looks like he could actually die, but for the most part he’s in complete control of his emotions. That same year another action film debuted, which deconstructed the ‘80s action hero and gave us a completely new take on the idea of fearlessness – Lethal Weapon. I admit I didn’t like Lethal Weapon the first time I saw it. In fact, I included it in a list of movies I regretted watching a few years ago. I’ve changed my mind about several films on that list since I wrote it, especially Lethal Weapon. I recently rewatched Lethal Weapon, and I found a lot to love about it. 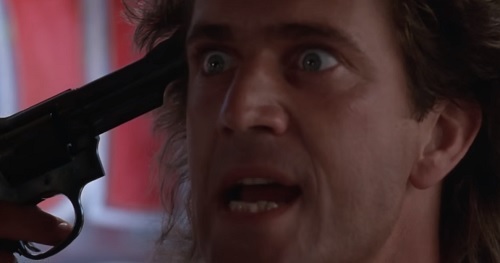 Most of all, I found Martin Riggs to be an incredibly compelling character and one that I can definitely empathize with. Let’s deconstruct this deconstruction of action heroes as we discuss Lethal Weapon’s unique take on the fearless action hero. At the start of the film, the closest Riggs has to a friend is his dog. Everyone around him sees him as either a problem or someone who’s not worth their time. The precinct’s psychologist is the only one who seems to worry about him as a person, but even she mainly just sees him as a threat to everyone around him. She tells the police chief that Riggs is a loose cannon who’s on the verge of doing something terrible. But the chief just brushes her off and says Riggs is fine. Neither of them is willing to actually talk with Riggs as a person and show him any kind of compassion. They just want to stop him or use him for their purposes. The first time Roger Murtaugh lays eyes on Riggs he, too, only sees a threat. Murtaugh is in his office at a police station, and he keeps glancing at this unkempt fellow in baggy clothes and a hat who looks like he’s waiting to be questioned by an officer. When the man casually pulls out a gun from under his shirt, Murtaugh springs into action and yells that the supposed perp has a gun. 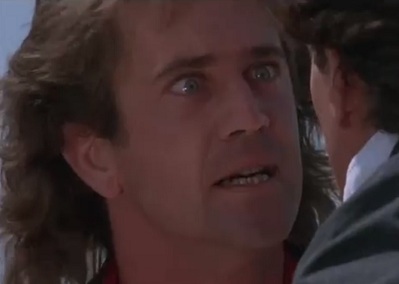 Not a perp at all, Riggs is surprised to see a fellow officer charging at him at full speed, and he takes Murtaugh down in a heartbeat before they both discover they’re going to be partners. Riggs takes it all in stride. He explains how royally screwed they both are because no one else wants to work with him, so Murtaugh is stuck with him. During their first day together, Riggs stops a man from committing suicide by handcuffing himself to the man and jumping off a building onto an inflatable cushion. Murtaugh is clearly shaken after watching his partner blur the line between saving a man and attempting his own suicide. He pulls Riggs aside and demands to know if Riggs is truly suicidal. Riggs tells him that he’s not afraid of dying, and the only thing he has to live for is his job. He’s been living in misery ever since his wife died in a car crash a few years ago, and he knows no one cares about him. Murtaugh hands Riggs his gun and tells him to blow his own head off if he really wants to die. 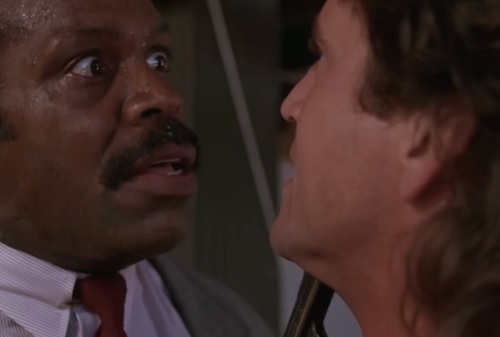 Riggs is right on the verge of pulling the trigger when Murtaugh stops him. This is one of my favorite scenes in the movie. Riggs clearly explains his motivations. Not fearing death may not be as admirable a quality as we might think. Some might not fear death because they trust that there’s something better waiting for them once they die, but that’s not exactly how Riggs sees things. He wants to be reunited with his dead wife, sure. But his desire for death is, more than anything, a release from pain. He feels tortured every minute he stays alive, and he spends his nights holding a particularly powerful bullet he’s selected to ensure he dies instantly when he finally pulls the trigger. Not exactly a healthy hobby. This makes him an effective weapon against criminals because he’s not afraid of taking risks and getting himself into potentially lethal situations. But all of this pent-up rage leaves him an emotional wreck, and this film definitely doesn’t glamorize his role as an action hero. Everything starts to change after Riggs saves Murtaugh’s life while attempting to arrest a suspect in their murder investigation. Riggs shoots the suspect to prevent him from killing Murtaugh, and then the two cops try to save him after he falls into a pool. Murtaugh takes Riggs home to dry off and introduces him to his wife and kids. Everyone is incredibly nice to Riggs, and suddenly Murtaugh begins to peel back his prejudice and see Riggs as a man who is hurting inside. He’s not a loose cannon or a lethal weapon, but a sad man who needs his help. This is the turning point of the film. Over the rest of the story, Riggs slowly opens up to Murtaugh and vice versa. The two characters develop a deep bond that makes Riggs take extreme measures to save Murtaugh and his family. Murtaugh also shows real empathy for Riggs and is desperately worried about him when he gets shot and finds himself in other dangerous situations. In the end, they both save each other by simultaneously shooting the final bad guy after he pulls a gun on them. Riggs began the film with a death wish. He didn’t see any way out of his miserable existence. What he needed was a friend – someone else who wanted him to live. It’s appropriate that at the end of the film Riggs offers Murtaugh the bullet he had planned to use to kill himself with. 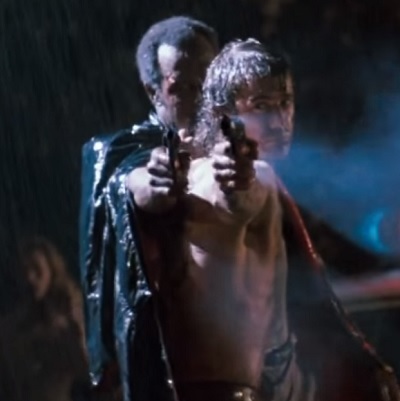 Murtaugh was the one who literally and figuratively took that gun out of his hands and pulled him back from the brink. The message of Lethal Weapon is that if you want to prevent people from being a danger to themselves and others, the solution isn’t to isolate them and treat them like a ticking time bomb. The best thing to do is to listen to them. Let them air their grievances, share their most personal feelings, and feel that someone cares about them. Riggs is not an unkillable, unfeeling terminator. He’s a man. The title of the film is very telling because it’s obviously referring to Riggs as a well-trained killing machine, but it’s also pointing out that this lethal weapon could easily be turned on itself. Riggs’ story would have ended in tragedy had it not been for another man who was not too old to put up with his crap. This entry was posted in Movies That Improve and tagged 1980s, action movies, drama, films, lethal weapon, movie review, movies, relationships, suicide. Bookmark the permalink. Great writing and insights again, Robert! Thank you! When I give a film I didn’t care for a second chance I often find I was wrong about it. Interesting. I may have to consider that with old films I disliked. Thanks for the tip! `Riggs is right on the verge of pulling the trigger when Murtaugh stops him.` Not just that, I think he actually pulls the trigger but murtaugh puts his finger between the hammer and the bullet in the last second. Wow! The Extreme level of that scene just went from 10 to 11! Such a powerful moment.